Welcome to another trip into the dollar bins. I actually found this comic for 75 cents. I’m not all that familiar with Dragonlance. I know it was a campaign setting for Dungeons and Dragons, but not much else. What I’ve learned is that Dragonlance is much more. It’s a universe in itself and has spawned novels, comics, video games and even an animated movie in 2008. What drew me to the comic was the Mike Kaluta cover. I like to pick up anything that contains his art. Not only did this book have a great cover but I was treated to a pretty good story inside, well more of a conclusion to a storyline. That was okay because the first page gave a quick synopsis in the form of an excerpt from the official record of Astinus of Palanthus. The story was written by Adam Blaustein with pencils by Ron Randall and inks by Randy Elliot. It follows a king who is in possession of a cursed sword and who is now under the control of an evil dragon. Commanded to kill his warrior daughter by the dragon he chases her down a snowy mountain. It’s a pretty good book and I’m eager to find the rest of this story arc, so it’s back to the bins! Today I’m taking a look at The Official Handbook of the Conan Universe. Always on the lookout for bargain comic book bins, I found this book at a local flea market for only 60 cents! Published by Marvel in January of 1986, this book has encyclopedic entries covering the previous 15 years of Marvel’s Conan books. Topics range from entries on individual characters, to regions, weapons and armor, and religion. It even has a map in the center pages. 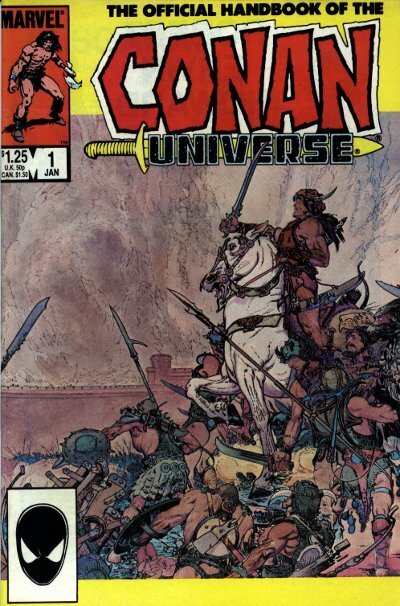 As alway Marvel does well in the art department when dealing with Conan. Art by John Buscema, Ernie Chan, Geoff Isherwood (among others) illustrate the content. 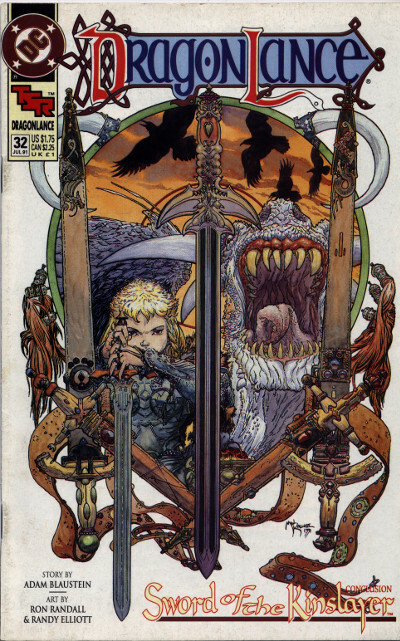 A gorgeous piece of art wraps around the cover by the great Mike Kaluta. I love the Official Handbooks of the Marvel Universe(OHOTMU) and this echoes those books in form and function. There’s lots of good info here for those interested. While at my local comic shop a few weeks ago I was directed to this little gem in the dollar bins by my local comic shop owner. I’m not a huge Sabretooth or Iron Fist fan but being the first appearance of Sabretooth and drawn by one of my favorite artists, I immediately snapped it up (along with a few other issues). Written by Chris Claremont and penciled by John Byrne, and published by Marvel in 1977. Danny Rand, Iron Fist, has been recruited by Collen Wing to assist her with bodyguarding Jeryn Hogarth, who was trying to find out who was embezzling money from Rand-Meachum. Sabretooth was sent in to stop Hogarth from finding out the culprit. He doesn’t seem to have his full power set yet in this story. He seems to have some kind of heightened senses. 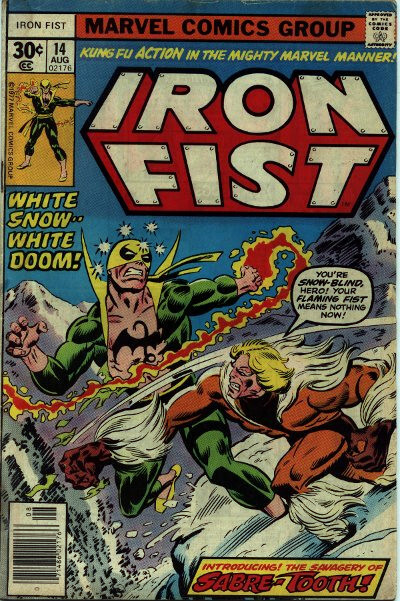 He’s very fast, strong, and has his claws but there is no mention of his healing factor, but that doesn’t mean he’s not a tough opponent for the Iron Fist. All in all a decent first appearance of a major Marvel villain. I love perusing dollar (or cheaper) bins at comic shops. You can discover all kinds of cool and interesting books rummaging through them. I’ll do my best to share my favorite issues with you here. A couple of weeks ago I came across a shop with a bunch of 50 cent boxes full of great stuff. One of the books was Pacific Presents #2, with The Rocketeer’s logo plastered on it. In researching the book for this post, I found that this was the original printing of Chapter 4 of The Rocketeer through Pacific Comics. I won’t bore you with a synopsis or review other than to say what you already know…it’s great! Not only do you get the fantastic work of Dave Stevens in this book, you also get a second story by the great Steve Ditko, called The Missing Man, a character I was totally unfamiliar with. This is a pretty dark and intense story. The Payne family (consisting of Paw, Maw, along with their daughter Misery and son Sorry) arrive in Circle City and begin to cause trouble. Not content to make money through robbery, the Paynes kidnap Ma, who runs a detective agency, and they hold her for ransom. It’s up to the keen computer skills of Todi (Ma’s daughter?) and Syd (The Missing Man) to solve the problem. It’s an interesting read and a good addition to this anthology title. If you’re a comics fan, there is plenty of content by two comic masters to entertain. 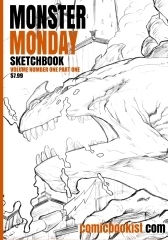 If you’re a comic creator, this should be considered an art and storytelling handbook. Study it! I’ll certainly be on the look out for the rest of this series for my own collection!